ANH-USA: Protect Your Right to Know about the Science Behind Supplements! Help us gain co-sponsors for the Free Speech about Science Act, HR 1364! Consumers are largely kept in the dark about the potential health benefits of foods and supplements. Why? Because current law makes it illegal for food and supplement producers to share this information. Congressmen Jason Chaffetz (R–UT) and Jared Polis (D–CO) have introduced the Free Speech about Science Act (HR 1364). 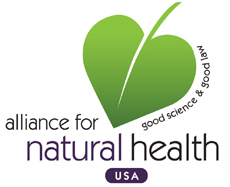 This landmark legislation protects basic free speech rights, ends censorship of science, and enables the natural health products community to share peer-reviewed scientific findings about natural health products with the public. At first sight, this might not appear to be a blockbuster bill. But look closely. If it passes, Free Speech about Science has the potential to transform the healthcare field by educating the public about the real science behind natural health. This is a small bill with vast potential leverage. For this very reason, the bill will have opposition. It will be opposed by the FDA, which flatly forbids food and supplement manufacturers from mentioning any link between a product and a health condition. This is true even if the link is established by peer-reviewed scientific studies coming out of Harvard and other highly respected universities. It will also be opposed by drug companies fearing competition from natural health approaches based on diet, dietary supplements, and lifestyle. Please do not let these special interests stop this bill. Please contact your representative today. Ask him or her to co-sponsor this vital legislation! Please Support My Right to Know About the Science Behind Foods and Food Supplements! I was thrilled to read that Reps. Chaffetz and Polis had introduced the Free Speech about Science Act (HR 1364). Please lend the bill your support by signing on as a co-sponsor! More and more Americans are taking charge of their personal health -- determined to improve their diets and emphasize preventive care in order to stay or get healthy. Consumers are looking for reliable information backed by legitimate scientific research to assist in making informed choices. But FDA regulations currently prohibit manufacturers of dietary supplements or producers of food from referring to any scientific study documenting the potential effect of the substance on a health condition. Violation of this ban can result in FDA declaring common dietary supplements and foods to be unapproved drugs, the sale of which is subject to large fines and jail. Cherry growers have been told by the FDA that they face jail if their websites even contain links to scientific studies from Harvard and elsewhere outlining the health benefits of cherries for gout or arthritis pain. Similar warnings have been sent to walnut producers and companies that tout the benefits of green tea! The Free Speech about Science Act provides a limited and carefully targeted change to FDA regulations so that legitimate, peer-reviewed, scientific studies may be referenced by manufacturers and producers without converting a healthy food or dietary supplement into an unapproved drug. The bill amends the appropriate sections of current law to allow the flow of legitimate scientific and educational information while still giving FDA and FTC the right to take action against misleading information and against false and unsubstantiated claims. The Free Speech about Science Act: 1. Provides a clear definition of the types of research that may be referenced by growers and manufacturers; 2. Ensures that referencing such research does not convert a food or dietary supplement into an "unapproved [and therefore illegal] new drug"; and 3. Does not in any way limit FDA and FTC authority to pursue any fraudulent and misleading statements. All of us, no matter our party or our views about healthcare, are coming to see the importance of preventive care, and of preventing illnesses before they start. Diet, dietary supplements, and lifestyle play a huge role in prevention. The FDA should be at the forefront of this. Instead it is blocking producers from giving consumers truthful scientific information about healthy foods. The FDA responds that cherries and the like should be subjected to the full FDA approval process. But this would cost as much as a billion dollars! With few exceptions, it is not possible for food producers to assume such costs for natural and therefore non-patentable products. This is the great "Catch-22" of contemporary American medicine. The FDA should find a less expensive way to "vet" natural products. Respected university research suggests that in many cases natural products are safer, more efficacious, and of course much cheaper than drugs. In the meantime, we should modify the law to at least let producers cite valid peer reviewed science. Please help me gain the information I need to stay healthy -- co-sponsor HR 1364, the Free Speech about Science Act!